Haven't posted anything here in yonks, and am still paying $89 a year to Typepad. No more. As part of a big spring clean of all my online artefacts this blog is coming to an end. Find me @manne, via hultberg.org or on LinkedIn. Cake. I miss cake. And I am really sorry, but those gluten free recipes to produce what usually becomes a really dense sponge thing just don't float my sweet tooth boat. They invariably disappoint me. 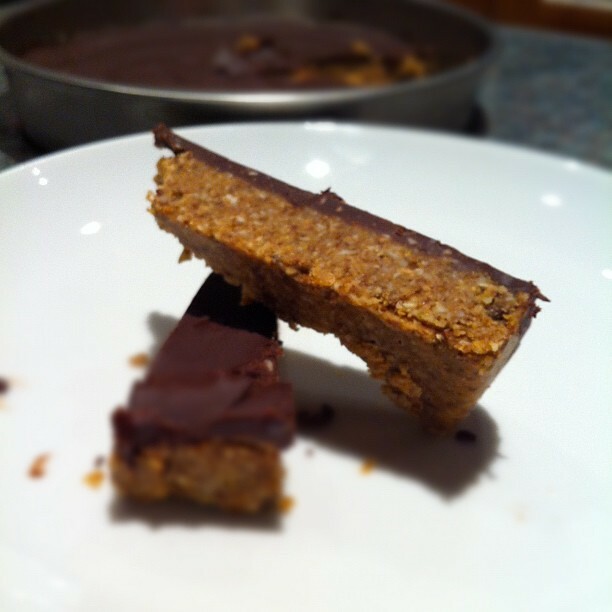 Here is a recipe (via Captain CaveDan, who in turn got it from Whole New Mom who calls this homemade protein bars...) for what I have found to be a great cake substitute. It satisfies on every level. Rich nutty flavour, lovely texture (hey, if it's going to be dense, go for proper dense with a crunch to boot), bit of sweetness from the honey, and a lovely layer of chocolate on top. When I make this next time, because I definitely will, I'll take a trick out of my mum's playbook and mix the melting chocolate with coconut butter before I spread it on top of the cake. In this way the chocolate will stay slightly soft making it easier to cut and serve. Without it the chocolate goes hard and brittle, going all over the plate as you try to cut it. Another interesting idea would be to mix the chocolate with some peppermint oil, or perhaps stir some chopped dried fruit into the mix... Sprinkling some of the dessicated coconut on top before the topping sets would be a nice touch I think. Using a food processor or stick blender (I have one of those incredibly versatile hand blender machines with a container attachment that chops almost anything) mix the nuts and seeds, flaxseed, shredded coconut, nut butter and salt to a coarse meal. If your coconut butter is solid, melt it in a small pot over a low heat, then add to the nut meal mix in the blender along with the honey and vanilla essence. Mix it all together to a thick paste. Press the mixture into a square (25-30cm across) or circular low pan. Get it nice and flat, you are going to pour liquid chocolate over this in a minute and you want a nice smooth surface. Easiest way to achieve this is to take a tablespoon and pressing gently with the rounded part, make circular motions from the center outwards towards the edge. To melt the chocolate, boil a small amount of water in a low pan and place a bowl on top. Place the chocolate in the bowl and stir until it melts. It should look something like this. Don't let the bowl touch the water, and make sure to not get any water in the bowl. This is where you can try to add some coconut oil to the chocolate and stir it together to stop the chocolate from going all brittle when it cools off. Pour the chocolate over the mixture in the pan, again using a tablespoon and pressing down very gently while making circular motions out towards the edges, make sure it covers the entire surface. Place in fridge to chill and set for a few hours. You are unlikely to finish the cake in one sitting unless there are several guests, it is absolutely packed with energy. Store in the fridge between "fika". Can you hear that? No? Me neither. There isn't a lot of crunch in the low carb world. When you rule out grains, and especially wheat, the world of baking is kind of a no go. Usually what we do at home to add that crunch back is cheat. Swedish crisp bread, especially the Finn Crisp Original, feels like an acceptable vehicle for cheese, hoummus and dips. Finally I have found an alternative: almond crackers, which I guess could be called "paleo crisps"! Quick and easy to make (unlike aubergine crisps, although those are delicious), really crunchy, nice savoury flavour and packed with goodness. All this while more than enough structural strength to withstand a swift scooping of even the thickest, chunkiest guacamole. These will become a staple. Next time I will try experimenting a bit by adding in some crushed coriander seeds, or chilli powder, for added flavouring. Mix all the ingredients in a bowl. I simply folded it all together with a spatula, no need to bring out the power tools. Place some baking paper on a baking tray and spread the mix thinly. 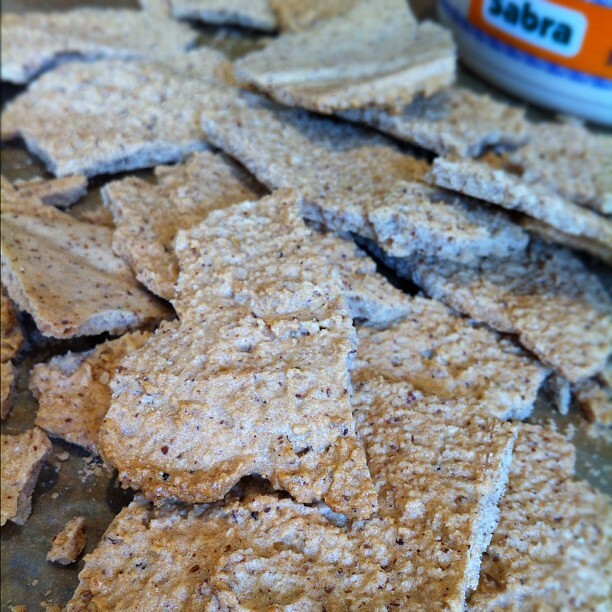 Try to form a square shape for later cutting / breaking it up in rectangular crackers. Bake for about 25 minutes, until you can see the edges and tops darken and the mix has crisped up. Take out the tray and set aside to cool and crisp up further. Using your hands, or a pizza cutter, break up in pieces. 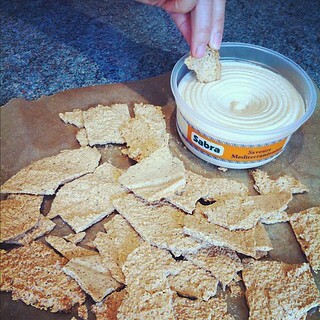 Dip in hoummus, salsa, guacamole... Or why not try the babba ganoush found with the original recipe? Delicious. Last week Ocado sent us an item we didn't order. Mistake, marketing treat, random act of kindness, I have no idea but since it was a tub of yoghurt, which we order a lot of, I guess it could be either of those things. Named "Lindahl's Turkish 10% Yoghurt" I got a bit excited. Is it Swedish (I sometimes dream of Swedish yoghurt and sour milk, or "filmjölk", something I really miss)? Why is it then labelled "Turkish"? 10%, awesome! Finding tasty, creamy full fat yoghurt without heaps of sugar in it is not easy, in my opinion. Looking at the details, it sounded quite promising. With only 5 grams of carbs per 100 grams, and added cream, it sounds like a dairy eating low carbers dream. Since the Swedish sounding name intrigued me, I did a quick google and yes, it's produced by a company from Sweden. Apparently, the man on the packaging has sued them for using his face without his permission. And he isn't Turkish at all, he is Greek! So... A "Turkish" yoghurt, made by a Swedish company, manufactured in Germany, marketed with a Greek face. We live in a multi cultural globalized world, no doubt about it! Anyway. This morning we used it for Wendy's "Yoghurt and frozen banana smoothie surprise", and as it turns out this is indeed a very creamy yoghurt! Really tasty, silky and rich. Tip: Make sure the bananas ripen properly before you freeze them. The more ripe they are, the sweeter they will be. We always keep a bunch of bananas in the freezer to use for treats like smoothies or banana bread (oooh, really naughty). As for surprise, add what you feel like. Wendy always adds a shot of espresso. But you can use peanut butter (my favourite), honey, blueberries, strawberries, or do combos: "Yoghurt and frozen banana peanut butter espresso blueberry smoothie"! What can ever go wrong? Put the bananas and yoghurt in a stick blender beaker, and mix together using the blender. Add your surprise, mix some more until smooth and creamy. Done. While not necessarily very strict low carb, it is a really tasty treat for those days where you want something sweet-ish with creamy richness. Lastly, thank you very much Ocado for sending us this random pot of globetrotter yoghurt! 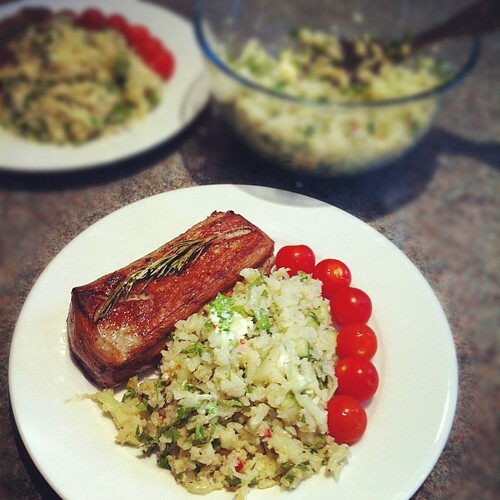 Cauliflower is so versatile, and the low-carb cooks best friend. Usually we use it to make a cauliflower mash (the cheese makes it really creamy), to go as a side for steaks and lamb, but with a few different additions it can be more like couscous, or like rice. 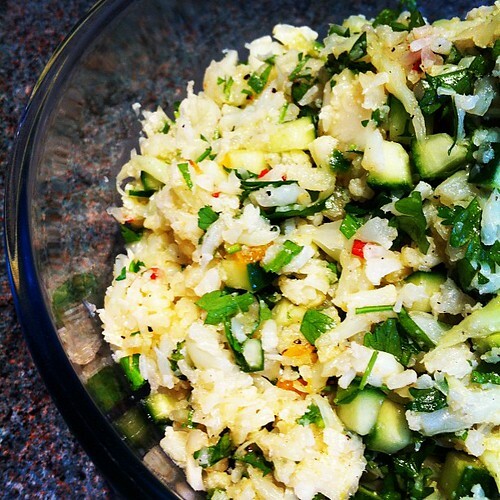 This recipe for cauliflower "couscous" salad is from the Rocket & Squash blog, but for sakes of speed (and using all of the cauliflower) rather than going with raw cauliflower I violated the recipe and steamed and crushed it instead. The dressing is delicious, slightly sweet, and went so well with our lamb. Would probably make a perfect match with duck breast. Next time I'll also add some toasted pine nuts for crunch and energy, and pomegranate seeds which I think will go superbly with the tangerine dressing! Cut up the cauliflower in florets, halved if they are large, and steam for 10 minutes. When done, remove the cauliflower from the steamer and leave it to cool and dry for a bit. While the cauliflower is cooling, chop the chilli and parsley, deseed the cucumber and cut it first in strips lengthwise and then small cubes. Place it all in a bowl. Put the steamed cauliflower in a pot and crush with for example a potato masher. When completely crushed, mix with the other salad ingredients in the bowl. For the dressing, just whisk all the ingredients together in a small bowl and season with salt and pepper to taste. If you want the dressing more tangy, add some more lemon juice. Pour the dressing over the salad, mix well. The original recipe calls for then leaving the salad to soak in the dressing for 30 minutes. I'm not sure why, but then taste it and if needed add some more seasoning. Serve with for example lamb loins, as below, or with fried duck breast. Delicious. The chilli is subtle, but adds a nice kick to the salad.